I’ve been a business owner for over a decade now and know the most frustrating days are usually when you feel like you’re going in circles and getting nowhere. You don’t have a plan. You second-guess what you should be working on, get distracted and jump from one thing to another without much direction. In order to be successful in business you must plan. Plan your year, plan your months and plan all the days in your weeks. Going into a workday without a plan is like walking down a busy street, trying to find your destination with your head down. You’re going to bump into people, miss your turns and probably arrive late, if at all. You’re constantly reacting to situations instead of being proactive. It’s: Oops, I just stepped in a puddle! Now my shoes and pants are dirty. Instead of: There’s a puddle coming up, I’ll move to the right to avoid it. When you keep your head up you can plan for what’s to come, react to situations quickly and avoid timely and costly mistakes. Let’s figure out how to keep your head up in business and plan ahead so your days are productive and you’re always working towards making money. Instead of: Get into 2 new retailers, get accepted to 3 new craft shows, make 10 sales through my website, etc. Break it down to what all of those goals are after: making sales. 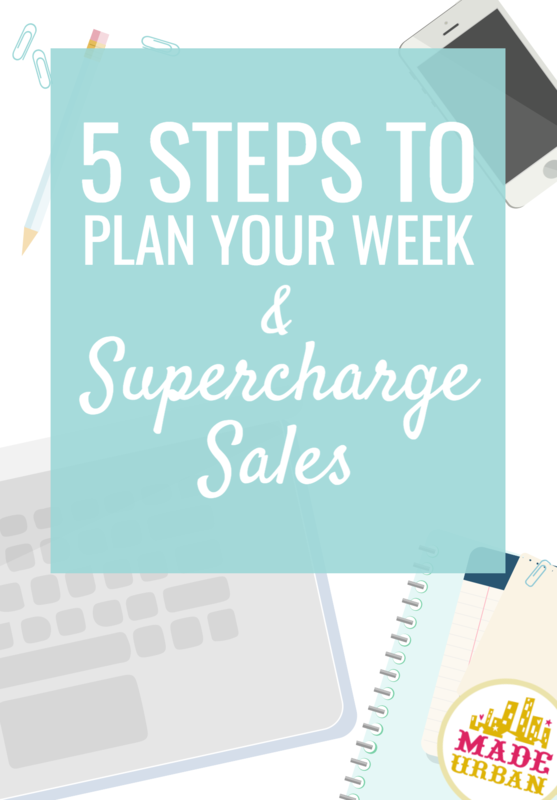 You can get specific and define how many sales you’d like to achieve that week or month but the important part is to keep your purpose top of mind. “Make sales” becomes your North Star. Put it on a sticky note if you need to but before you start any task, ask yourself: Does this move me closer to making a sale? Some answers will be simple. While others may be a little more complicated. A task may not directly lead to a sale but it may indirectly have an impact on the money you make. Think of a sales channel as the way money comes in. How do your customers purchase your products? Direct sales channels – such as your website or selling at a craft show, where you sell directly to the customer. Indirect sales channels – such as retailers or affiliates, who sell your product for you. Facebook, Instagram or your newsletter would not be considered sales channels, unless you have a way for customers to place orders through them. If you simply use those methods to showcase your products and link to your website to make a sale, they’d be considered your marketing channels. Write down all the sales channels your business uses. There are just a few examples in this article; your business may use others not listed here. Try to keep your list general. Instead of listing the 3 different retail stores you sell your goods wholesale to, just list “retailers”. Selling to each retailer likely involves very similar tasks. If the tasks involved are much different (for example, selling to an online retailer requires a different process than selling to a boutique) then list each one as a sales channel (e.g. Online Retailer & Offline Retailer). The problem we usually run into on those unproductive days is that we’re looking for things to do, to get a sale RIGHT NOW. But those tasks are few and far between and usually less effective when done last minute, out of desperation. I like to define my money-making tasks by activities that will generate money NOW, LATER or in the FUTURE. There are also tasks that don’t bring in any money. Some are necessary to business while others may be time wasters. NEVER (make money) is another heading I use to organize my tasks. Let’s take a look at each type of money-making task. A) NOW – WHAT MAKES YOU MONEY TODAY? These are the tasks you can complete today and see sales come in within hours or a couple days. These activities are only one or two steps away from making a sale. 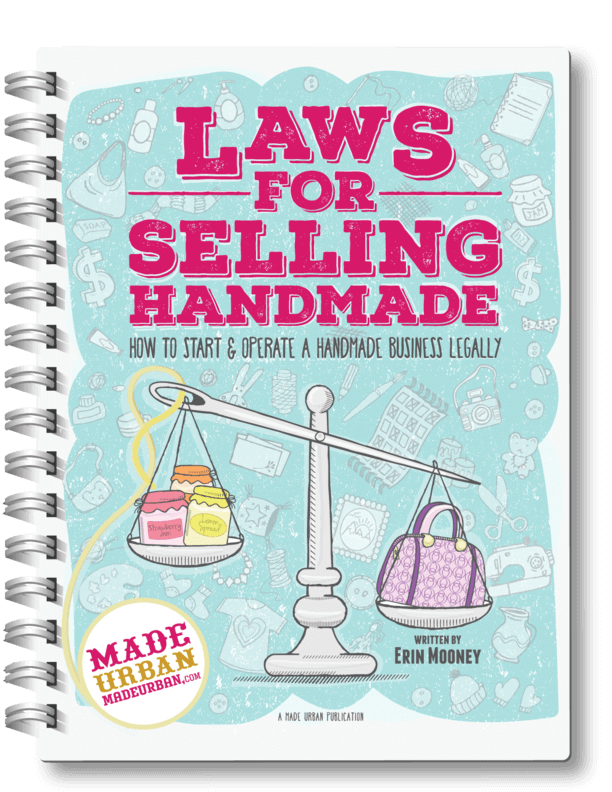 Setting up and selling at a craft show – you’ll make sales the day of the event. Sending out a newsletter – announcing a sale, promotion or new products available for purchase should bring shoppers in and make a few sales within hours of sending the email. Following up with retailers – if they place an order, that’s money in your pocket. B) LATER – WHAT MAKES YOU MONEY NEXT WEEK? These are tasks that require a few steps in order to make a sale. 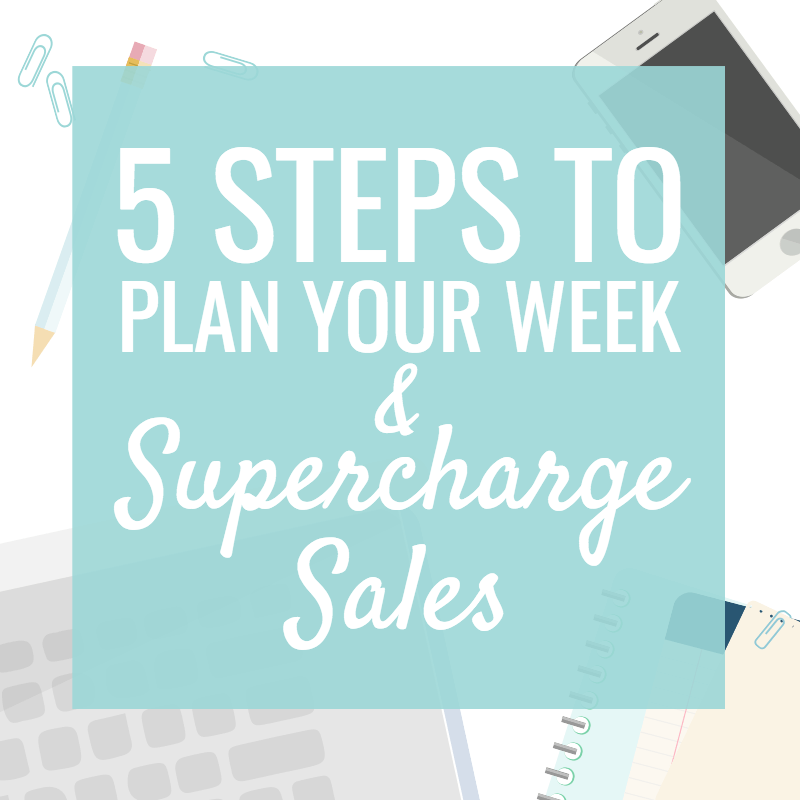 Completing these tasks today will lead to a sale a week or two down the line. They may be activities that prepare you for “NOW” tasks or will improve “NOW” tasks to generate more sales (such as: gaining more newsletter subscribers will increase your chances of making a sale when sent out). Announcing an upcoming event – marketing the craft show you’ll be at next weekend through Facebook, your newsletter, etc. will encourage more people to visit you in a week and potentially buy. Photographing products – setting up a session to photograph all your new products will help bring in sales when you upload and post the photos to your website, social media pages and in your newsletter. Sending out Lookbooks – mailing your lookbook to retailers or dropping them off may lead to an order placed in a week or two. C) FUTURE – WHAT MAKES YOU MONEY NEXT MONTH? These tasks are several steps away from making you a sale and you may not see a return on your money or time for several weeks or months. They may be activities that prepare you for “LATER” tasks or will improve “LATER” tasks to generate more sales (such as: growing your social media following so more people see your upcoming event announcement, which potentially leads to more craft show visitors and more sales). Applying to craft shows – in order to sell at holiday events, you must start researching, applying and preparing months in advance. Creating new product – if you spend the day designing and creating new product collections, it will eventually lead to a sale once you photograph it, launch it and share it through your marketing channels. Designing a lookbook – the initial work of creating a catalog of your work won’t bring in a sale that day but may bring in several sales weeks later once they’re sent to local retailers and you follow up with an order sheet. D) NEVER – WHAT WON’T MAKE YOU MONEY? As much as we would love to only work on activities that make us money, there are still tasks that are necessary to our business but don’t always lead to a sale. For each sales channel you listed in step 2, write down the tasks that drive sales through them NOW, LATER, and in the FUTURE. Next, list the NEVER tasks that apply to your overall business. Many of these will likely apply to all areas of your business but you can examine each sales channel to get started. It also helps to mentally run through a typical day to catch all the little tasks. Checking Facebook for comments and messages may not fall under a particular area of business but may be something you do everyday. Try to get all the tasks and activities that fill up your time on a list. Not all tasks are equal and before you start your day, week or month, you should be determining which tasks are high value and should be at the top of your to-do list and which should get less attention or can be addressed later. There will never be enough hours in a day to get it all done. Some things HAVE TO take a backburner to others. You become effective, productive and profitable in business when you’re able to sort through ALL the many things that need your attention and choose the high value ones to focus on. What’s my return on investment? Should be a question you ask before heading into any task. To start, you must put a value on your time. It’s such an important step many small business owners skip because they figure: it’s not hard cash coming out of my pocket, it’s just my time and I don’t mind spending a few hours on this. The problem is; all those hours add up and eventually a few unpaid hours here and a few more there make up more of your work schedule than the hours you do get paid for. Think of it this way: if you had to hire someone to do a job, how much would you be willing to pay them? Let’s assume you’re paying a minimum wage, which is $15/hour in your jurisdiction. If you had an employee working for you for 40 hours per week, how many of those hours would you want them spending on a task such as: scrolling through Instagram and liking photos? If you’re currently spending an hour on Instagram every day, checking out photos and profiles, liking and commenting, would you be willing to pay someone over $100/week to do the same? How many products must you sell in order to cover that $100? And how many sales does Instagram scrolling, liking and commenting bring in? If it’s not $100 worth of sales, that task is not giving you a ROI. Considering you’re likely doing all the work in your business and don’t have any employees; what would you like to pay yourself per hour? Apply that hourly wage to the number of hours you spend on a task and determine how many sales the task brings in. If the money it generates doesn’t cover your hourly wage, is it worth your time? Again, there may be tasks you must complete (such as taxes) that don’t return your hourly wage through sales. In those circumstances, try to get in, get the job done and get out as quickly and efficiently as possible so you’re not dragging out low ROI tasks. 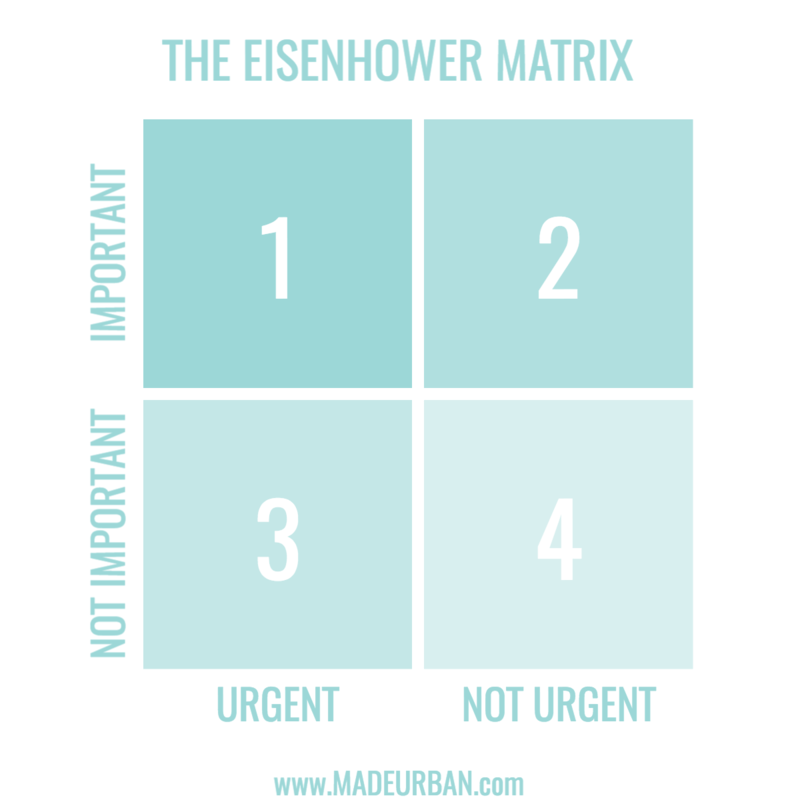 Go through each task on your list and assign it a value number based on the Eisenhower Matrix. The importance and urgency you give to a task will change as time goes by and you’ll want to reassess tasks on a weekly and sometimes daily basis. Value each tasks based on their importance and urgency today or this week. If “selling at a craft show” is on your list but the event isn’t until next week, it’s an important task but not urgent. Next week, when you’re trying to figure out what you can fit in, the craft show will take a #1 spot because it’s then important and urgent. Taxes may be important but not urgent until tax season. If you’re reading this article, you may be working in your business as opposed to on it. Meaning you’re not looking ahead and being proactive but rather deciding right now, what you should be working on…..right now. It’s hard to be productive and effective when you’re constantly reacting to your business. I need to make more money! I should design a new product today, take a photo of it, add it to my website and post it to social media. You’re rushing through the process instead of strategically thinking about what type of product you really need to add to your line up, how it works with your existing products, waiting for the right time of day and lighting to photograph the product, finding the perfect props to be in the photo, writing a thoughtful description that sells, instead of telling what the product is, and posting it to social media at the optimal time. Once you get your feet under you today, you can start looking ahead and planning where you’re going to plant your feet and take the next steps tomorrow, next week, for the month and even for the year. Then, creating a new product becomes: determining the best time of year to launch a product, researching trends for the season, planning collections (this is covered in the free download from my ebook MAKE MORE MONEY AT CRAFT FAIRS, download the free chapter here), sourcing materials and finding deals, designing product features based on a survey you run, etc. You create a process that is strategic and effective. But you can’t get ahead if you don’t plan. Everything must be written into your schedule thoughtfully. Otherwise you start each day with What should I work on today? Take out a calendar or print one that has space to write. Start by filling in your calendar with NOW tasks. Schedule the ones you marked with the Eisenhower Matrix score of 1. Then any marked as 2 and so on and so forth. You should try to have at least one NOW task each week. For example, you may send a newsletter each week. Some weeks may have 2 or 3 NOW tasks. For example, you may send a newsletter, sell at a craft show and follow up with retailers in a week. Then work back from those NOW tasks and fill in your important/urgent LATER tasks. Followed by your important/not urgent, then not important urgent and finally not important/not urgent. For example, if you plan to send a newsletter at the beginning of each week, Tuesday, Wednesday and Thursday the week before may be spent, writing and posting an article to your blog, drafting the newsletter to share the blog post and scheduling the newsletter to send the following week. Next, fill in your FUTURE tasks base on the Eisenhower Matrix score, working back from LATER tasks. For example, if you want to sell at a craft show the first week of November, work your way back and determine when you need to start applying to November events, based on application deadlines. Lastly, fill in any NEVER tasks based on their Eisenhower Matrix score. The tasks that fall into not important/not urgent my be tasks you leave off your schedule altogether and are simply reminders of what to avoid in a workweek. Be sure to keep your calendar in a place where you’ll see it and use it. Adjust as you go and if you don’t complete a task by the end of a day, move it to #1 on the list for tomorrow’s tasks. This article is to help you schedule and plan tasks that are currently a part of your business. It will help you get organized based on your business now. If you want to increase sales and grow your business, you must add new tasks and activities to your list. But just as we were strategic in this exercise to plan and prioritize, you must also be when adding new practices. Don’t jump on Periscope because someone has said it’s the next big thing or start paying to post ads anywhere and everywhere in hopes it will get you more sales. Think about who’s right for your product, where you can find them and what they’re attracted to. That way you’ll be posting the right content in the right place to market your business and sell your products. What do you think? Did you find this advice and system helpful? Are there any tasks you have a hard time organizing or fitting in? Great article. I enjoyed every bit and learned on top of that, not to mention it was free advice. Thank you. This is such a helpful article! (Yes I’m one of those people who can’t help but keep checking Instagram and Facebook at times) Thanks for writing this article – will really help map out priorities. Fantastic article!! As owner of multiple businesses it’s a challenge sometimes to focus on the money making tasks rather than all the other stuff. This is extremely helpful!! Thanks so much for reading Laura, Rose and Erin!! I’m terrible at making and keeping schedules. I have quite a few medical conditions that hold me back, and while I know I shouldn’t use excuses, I find it all very difficult. In the past, I was able to create more, brainstorm more, and get more done. Now, my fatigue/narcolepsy have been acting as a massive blockade to getting things done. In addition to that, I have the curse of wanting to branch out too much. There are just too many fun things to do in the world of jewelry making, and I want to learn it all! I’m constantly intrigued by new techniques and I always want to experiment. I don’t know what my niche is, but I started out selling macrame and that’s still mainly what I do, only now I’m also weaving. I think it’s important to follow your own schedule and patterns and listen to your body. Work on your business when you feel good and are inspired to and try not to feel guilty if there are times you don’t get as much done as you’d like to. We all have 101 things we feel like we should be doing but it’s your business and you can go at a pace that feels best for you and run it the way you want to. I’ve noticed that I get a great reception on Instagram, even though my photos are far from great and I need to start staging them properly. I think it has the potential to be a springboard for me and so I’m going to start investing more time and energy in making sure my photos are staged and well-edited before posting and I’ll try to engage more, as well. I have it set up so that it posts on my other social media sites when I post on IG, but I’m not sure if that’s what I should do, or if I should just have a little preview of Instagram on my other sites. Maybe just integrate a few, instead of all. I think I read that flooding all of the platforms with the same content isn’t supposed to be ideal. I’ll figure it out eventually. I feel like I go snail-slow compared to a lot of other people who initially took it more seriously and treated it more like a business, but I think if I just invest more time in the RIGHT things, I’ll get there.